Of Sorrow and Such is from Tor.com’s new flagship novella imprint and is set in the universe I created for the Sourdough Cycle. It follows Patience, whose early life was introduced in “Gallowberries” and whose later years were hinted at in “Sister, Sister” (both in Sourdough and Other Stories). I always wanted to go back and explore what happened in between. 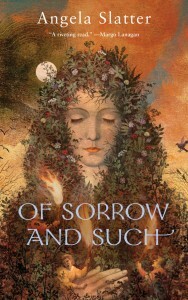 Also: Of Sorrow and Such won the Ditmar Award for Best Novella at Contact 2016, the annual national Australian Spec-Fic convention. You can buy it here or ask politely about it in your local genre specialist bookstore (like Brisbane’s wonderful Pulp Fiction).